Ceiling mounted Radiant Heating Panel Systems are very similar to other air-water systems in respect to the arrangement of the components, however, the significant difference being that the thermal comfort in the room is maintained by radiant heat instead of convective heat, the importance of this is illustrated in the following analogy: "You are walking outdoors on a brisk winter day in bright sunshine. The sun then goes behind a cloud. 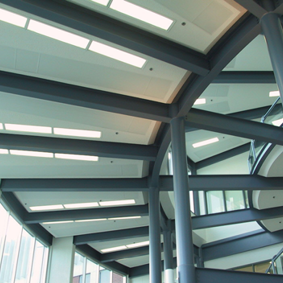 Although you feel an immediate chill, the outside temperature does not change when the sun disappears behind the cloud; it is just that you were, until that instant, being bathed in a warming radiant field" Radiant ceiling panels create a radiant field, similar to the sun but of lower intensity, inside the occupied space. Heat can be transferred in many ways: Conduction - heat transferred by objects that are touching each other. Convection - heat that is carried from a warmer to a cooler body by an intermediate fluid such as air. Radiation – heat transferred to all items “seen” by the panel which are at a lower absolute temperature than the panel itself. 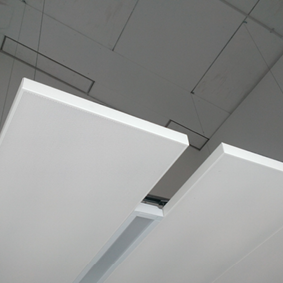 Most conventional tube and fin “radiators” are in fact, convectors. They heat a space by warming the air that passes by the heated fins. The air now rises due to bouancy, this is known as free convection. When air is moved past the fins using a fan, it is called forced convection. Both principles are the same, they compensate for perimeter heat loss by circulating warm air within the space. 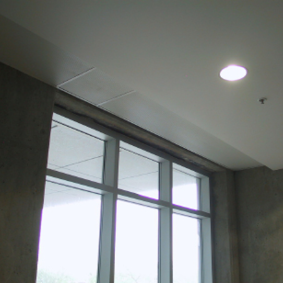 Panels are generally mounted in the ceiling to allow the panel to "see" the objects they are trying to heat and provide a better distribution of heat. It also allows higher surface temperatures to be used than wall mounted radiators, making them comparatively more effective radiators. Radiant panel technology is not new to the HVAC industry. It has been used in Europe for over 100 years most notably in Hospitals, Schools, Laboratories and Institutional applications.